In a most dramatic way, Jesus demonstrated that He did not come only to be human like us. That was accomplished in the Incarnation. No, He became flesh and blood so that He could step into the place of sinners and accomplish what John’s baptism only symbolized. Water, all of its own, can’t wash away the ocean of human sin! That could only happen with the death of sin itself, represented in baptism by the penitent’s disappearance under the surface of the water. Sin’s consequences mean death; man’s rebellion against his Creator requires a just punishment. When that requirement is satisfied, the penitent is free. Jesus got baptized as His first public act of identification with man’s sin and His first step to defeat it, releasing all those held captive by it. That, of course, would require Him to be submerged into death, into the grave, into the netherworld—the Cross. His victory over those would be accomplished by His Resurrection; here it is symbolized by the opening of heaven and the descent of the Holy Spirit. In the old order, death meant the end, a dissolution. In the new order Jesus came to bring, death in the water of baptism means new life, a re-birth, a truly new and eternal start. 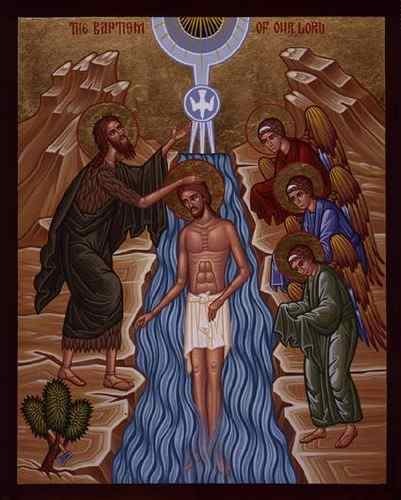 God spoke on the day of Jesus’ baptism: “This is My beloved Son, with Whom I am well-pleased.” All those re-born in the waters of baptism that Jesus has given to His Church receive this same expression of love and delight from our Father. Jesus makes it possible for all of us to be born again into the relationship God originally intended for man and woman, blurred and distorted now by sin. 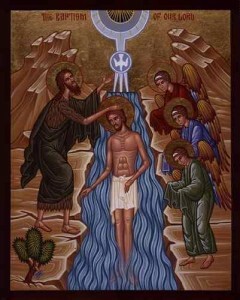 His baptism is not only with water but with “the Holy Spirit and fire.” It wipes away sin and implants divine life in us. John the Baptist knew his baptism could not accomplish that! In humility, he acknowledges this: “I need to be baptized by You, and yet You are coming to me?” Still, God allowed him to participate in the first public act of the Messiah for Whom he worked so tirelessly to prepare. What a blessed day that must have been for him.